Behold the most natural, the most organic and the best of the best burgers in the whole world! 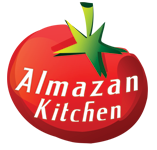 Cooked with love and AlmazanKitchen secret technique. Yes! We will share our secret with you! The secret is in our special fermentation technique that we used to make the free-range buffalo mince even better. Some caramelized homegrown onions with fresh honey for sweetness, superb balsamic vinegar for sour notes, homemade mayo-herb sauce for freshness and toasted somun bread with some lamb lard that made this incredible burger really crispy. Did I mention that it is also stuffed with homemade hot cheese and smoked bacon? Knead 700g free-range buffalo mince. Salt it. Knead a little more. Put the mince in the cold to ferment place up to 30 days. Do not forget to knead it every day. Add 1 tbsp. of lamb lard into the pan. Cut “somun” bread in half. Make both halves crispy from the inside. Toss into the pan and fry it. Add 1 tbsp. of lamb lard. Add 1 tbsp. of fresh honey. Caramelize everything in the pen for 40 min. Slice & dice 70g of homemade hot cheese. Cover the board and your hands with some veg. oil to prevent meat from sticking to it. Make a flat patty. Choose the size according to your taste. Add some sliced hot cheese & homemade smoked bacon above. Cover with another patty. Attenuate it and smooth both patties together. Warm both halves of somun bread. Add fried onions on the top of the patty. Some sljivovica for the better taste. Few drips of the homemade mayo with herbs and premium balsamic vinegar. I just wanted to know that how you make hot cheese ? Because these cheese which I saw on YouTube n my mind start to think how is made ? I think it’s a rare cheese n that bun is also rare can u send the repice of bun n cheese pls I know it’s top secret but I won’t tell anyone n I just age of 16 n I’m interested in cooking. Druže da li i šta stavljaš u mleveno meso osim junetine? Da li je 100% junetina ili ubacuješ nešto da je zamasti i slepi? Koje delove juneta koristiš? PS: Ubijaš kako kuvaš! Čista desetka! Svaka čast i na ideji i na konceptu i na kuvanju i na produkciji! Oh my Foodness :O Wow. It is indeed the best burger.